PickletExport.jsx for Adobe Photoshop (CS3 and later) on Windows and Mac OS X. The source is also available in the picklet-export repository on github. This action will create a new Photoshop document with the dimensions of the iPhone4 screen (640px x 960px). You can specify how many panels you want to set up initially. This action will export only the currently selected layer (selected in the Layers palette) to the destination specified. Optionally saves the full-sized layer image. Where to save the files to. Typical setup is to set this to your Dropbox/Public/picklets folder, so the files can be accessed from your Picklet Builder account. Option to save a set of cover images (cover_thumbnail.png, cover_thumbnail@2x.png, cover.png, cover@2x.png). These images correspond to the ‘cover’ Layer Comp. Option to save thumbnails (for display purposes in the Picklet Builder app – to help you navigate between the panels of your picklet). Option to export the layers for a single panel, specified by selecting the corresponding Layer Comp (in the Layer Comps palette). Option to create a picklet.json file which stores layer positions that the Picklet Builder app can load using ‘Template positions’ link in panels palette. When you’re optimising picklet file sizes, if you have large images that don’t require full alpha channel you can save the layer image as a PNG with smaller file size. 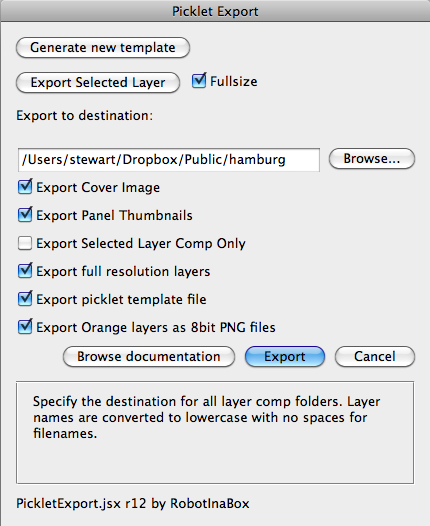 In the ‘Layer properties…’ dialog set the layer Color to ‘Orange’ and make sure this option is selected.